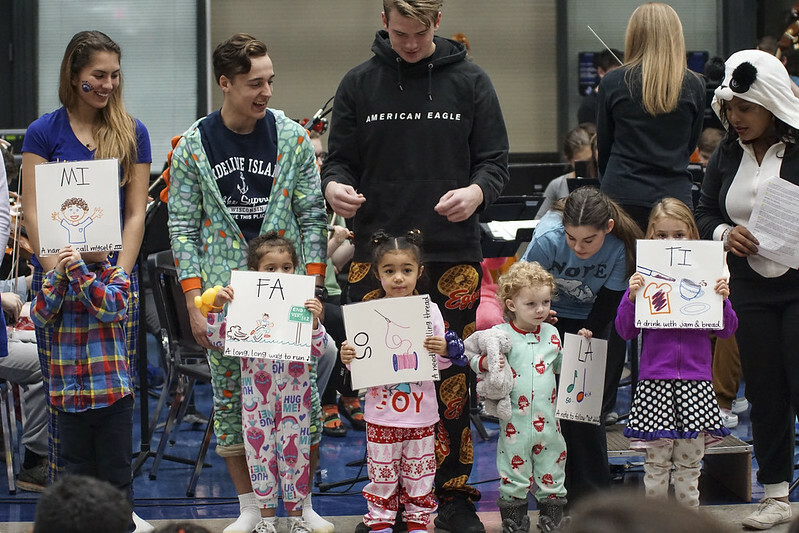 Pajamas, stuffed animals, blankets, and familiar Disney songs were staple attractions at the annual Young People’s Concert on Oct. 23. Hopkins High School orchestra, made up of about 65 students, performed a variety of Disney-themed songs for young kids and their families at the Young People’s Concert on Oct. 23. The familiar tunes delighted kids as many of them bopped along with the beat. Kids came to the family-friendly event dressed in their pajamas with stuffed animals and blankets in tow. The orchestra performed while a balloon artist crafted intricate balloon animals and a face painter gave kids colorful face art. Conducted by Alison Swiggum, the orchestra played songs from Beauty & the Beast, The Lion King, Frozen, and more. For the final song of the night, Swiggum invited children to the front and handed them pencils. While a song from The Little Mermaid was performed, the children took turns using their pencil to direct the orchestra. After the show, children got to try their hand at a string instrument from the orchestra at the instrument “petting zoo.” Kids were excited and astonished to be able to pluck the strings of the cello and use a bow to play the viola. Young People's Concert 2018 from Hopkins Public Schools on Vimeo.